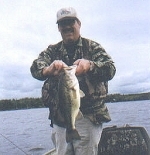 You probably already know that Black Lake is one of the top rated bass fishing lakes in the Northeast. 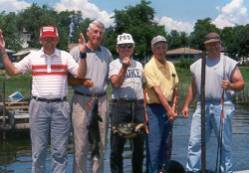 It is abundant with largemouth and smallmouth bass. northern pike, and a wide variety of pan fish. Even the walleye have made an aggressive comeback. You may even hook an occasional muskie! But, the crappie is still the most popular and sought after. They're our personal favorites especially in the frying pan. 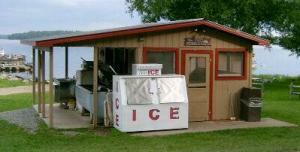 McLear's hosts the weigh-in site for numerous bass clubs and crappie tournaments. Our docks are rated at the top, even by serious boaters. The 20' steel frame, treated lumber deck slips will handle everything from dinghies to bass boats. Plus, we provide a spacious fishing pier. Electricity is available, but please bring your own extension cord. 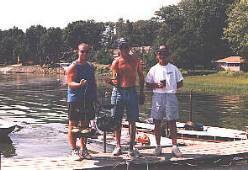 Black Lake offers some of the best Calico Bass fishing in New York State. You can't beat the "Crappie" for its taste while frying them over an open campfire. Our Fish cleaning building is centrally located, fully equipped and one of the finest facilities available.